I decided to work on a still life for my final piece, partly because I had been drawn to the bowl of fruit on the dining room sketches but also because I had enjoyed using strong colours in my monochrome exercise of pears. I wanted to develop this further with a drawing that focuses on two main colour groups, red and green. This also provided me with the opportunity to use pencil again but I wanted a stronger colour than I had produced in exercise two- still life in tone. After some preliminary drawings and practise using different media I decided to also use oil pastels and maybe chalks too to give added depth and texture. Then I used my view finder to plan how far to ‘crop’ into the picture in landscape format. I decided to put down a wash of pale green in acrylic paint, hoping it would give a green base of colour to all the forms. 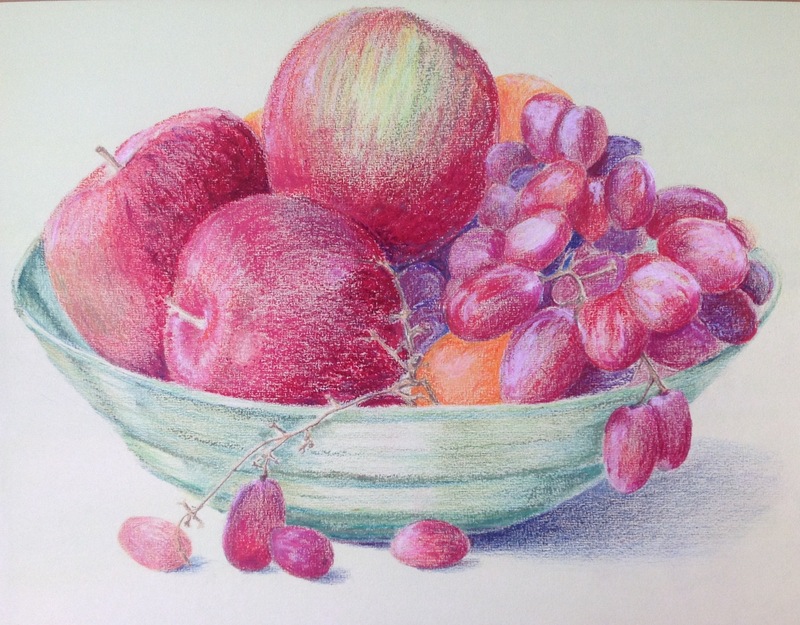 I have tried to use a mixture of mediums, oil pastels, pencils and chalk to capture the strong colours of the fruit and bowl and their different textures. The acrylic wash has added green undertones to the fruit as it cuts through the thinner applications of colour. As a composition I chose to zoom in on the bowl from slightly above as if the viewer could reach out and help themselves. I could have added interest by choosing fruit that had less round/oval forms to add more variation. Although I consciously chose not to have a background the composition may have had more interest if the colour of the background had more contrast. Although the pencils and pastels have given strong colours and interesting marks and smudges, I have not achieved the waxy, shine of the apples skin or the luminosity of the grapes that I had hoped for. Maybe a different medium would have worked better, or maybe it is my inexperience with using pastels. I feel I have achieved good tonal contrast and am learning to work on a larger scale. For me this is to do with expression. I am aware that I am so absorbed with translating the image in front of me that I become anxious and do not leave myself the freedom to experiment and play. Especially as this is a final assessment piece. I would like my lines and marks to be more fluid and looser,to portray the softness of the grapes against the firmer apples, but I am not yet sure how to achieve this. I am pleased that I have experimented with a new medium and worked at layering different media. If I had more time I should have spent longer on my preliminary sketches which may have given me the confidence to try something bolder. Having looked at the drawings of Graham Little,in pencil and the strength of colour he had achieved it encouraged me to have another try with pencil, I also was interested in how he had used acrylics to create the effect of the woman looking through a window perhaps. I decided to try an acrylic wash as a base in this instance but would like to try it the other way around another time. When looking at rooms around my house, I was struck by the neutral and muted colours which I have chosen I guess because these are natures colours and those that give me a sense of peace. However, for this piece I wanted to explore vibrant colour, hence my subject choice of apples and grapes as a still life instead of ‘around the house’.